This is a project of American University students, faculty, and designers. Our leadership strategy is to tap the organizational nodes on campus. 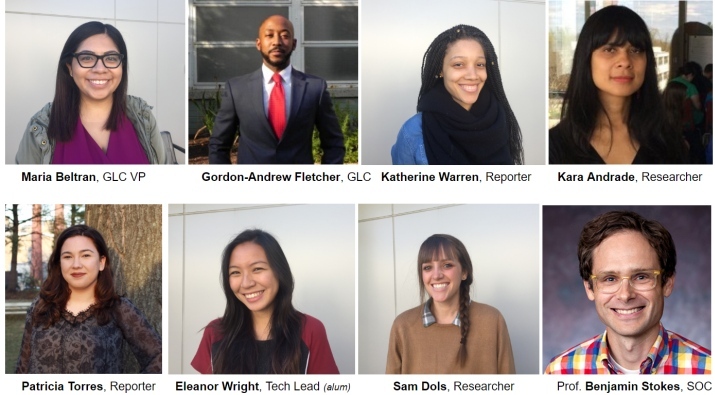 Core design team: Our project is led and funded by AU’s elected Graduate Leadership Council (GLC) on the editorial side, and the Leimert Phone Company on the design side. Supporting organizations and divisions: The Center for Diversity and Inclusion (CDI), the AU Library and oral history archives, and the Office of Campus Life. If your organization would like to join, please contact us! Key team members include: Gordon-Andrew Fletcher, GLC President, Maria Beltran, VP Communications of GLC, Kara Andrade, former VP Communications of GLC/Researcher, Benjamin Stokes, co-founder of the Leimert Phone Company and faculty lead (AU School of Communication), Katherine Warren and Patricia Torres, reporters and MA students in broadcast journalism, and Samantha Dols, research lead and PhD student in the School of Communication; alumni include: Eleanor Wright, technical lead and Computer Science undergrad. Want to collaborate too? Contact us. Disclaimer: specific stories are not endorsed by our partners or advisors; any questions about stories can be raised with our editorial group via the contact us page.